BURNS, WILLIAM, businessman, militia officer, and politician; b. c. 1755 in Great Britain; d. unmarried 25 Sept. 1829 at Quebec. William Burns set out from Great Britain about 1770, reputedly with his father, who may have been George Burns, a British army officer. His death at sea left William an orphan, but on arriving at Quebec he was taken in by John Melvin and made a clerk in the mercantile house of Melvin and Meredith Wills. Distracted briefly by his role as a militiaman during the American invasion of 1775–76, Burns quickly gained experience in the mechanics of the Quebec trade, including marketing wheat (notably for Samuel Jacobs*), coordinating river transport for the firm’s business, auctioneering (Melvin and Wills was appointed public vendue master for Quebec in 1778), and dealing with London suppliers and their agents. By August 1784 Burns had been brought in as a partner, the company becoming Melvin, Wills, and Burns. Following Wills’s death, some time before mid 1787, the firm continued as Melvin and Burns. Melvin died in August 1791. The following month Burns himself became public vendue master, and by the spring of 1792 he had taken John William Woolsey* into partnership, forming Burns and Woolsey, auctioneers, commission merchants, and brokers. During the period 1790–1808 Burns emerged as a major merchant and wholesaler. He was involved in all the profitable sectors of the economy and continued to diversify his investments. Interested in the hunting and fishing sector, he held shares in a company operating in Labrador and the lower St Lawrence region. To develop the Îles de Mingan and the seigneury of Saint-Paul he went into partnership with influential businessmen John Richardson, Patrick Langan, Woolsey, and Mathew Lymburner. In addition he was in the lumber business with Woolsey and a number of other partners, and generally sold the product wholesale by auction. He also imported and exported dry goods. The firm of Burns and Woolsey sold, at wholesale and retail, foodstuffs, spirits from the British West Indies, European wines, books, household goods, and lottery tickets. Besides being public vendue master Burns was a well-known and respected auctioneer, holding sales with Woolsey on the various wharfs in Lower Town. Large volumes of merchandise, even entire cargoes and ships, passed through their auction books, particularly during the port’s restricted shipping season. In comparison with the busier ports of the Atlantic seaboard, the scale of trade at Quebec was small. This situation left most of the auction business to the port’s major practitioners, Burns and John Jones*, and was reflected in the apparent absence of complaints from importers and shopkeepers against undercutting by auctioneers. As a result, and possibly because of Burns’s expertise on the rostrum, auctioneering at Quebec remained unregulated; in 1805, and again a year later, Burns did request the intervention of the Executive Council, but only to fix commission rates for auctioneers. 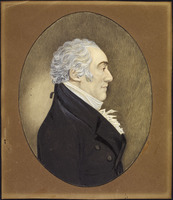 Burns ended his partnership with Woolsey in 1806. He probably no longer needed the backing of a permanent partner, since he not only had been active in the firm of Burns and Woolsey but already was doing business on his own account. He seemed to be more successful alone than when working with Woolsey, who indeed later owed him sizeable sums. After the firm was dissolved Burns went into partnership with other merchants solely for specific transactions, such as the purchase by three people of a seigneury or a wood-lot. Although he did not abandon trade, during the period 1810–30 Burns speculated heavily in real estate and land in Quebec itself and on the outskirts of the town. The massive scale of the capital he invested can readily be illustrated. On 20 Sept. 1824 Burns bought 26 pieces of land at a sheriff’s auction. Less than 11 months later he sold them all to Mary Neilson, notary Thomas Lee’s wife, who had contracted marriage “without community of property.” But six months before making this sale Burns had been able to purchase 30 more lots in the faubourg Saint-Jean. At the same time Burns was offering his services as a ship-broker and land agent. In 1813, for example, he acted for a John Scott of London in selling pieces of land to a merchant. Two years later he became the attorney for some heirs to the fief of Grosse-Île who wanted to sell it; he concluded the transaction with Quebec merchant Louis Gauvreau, a member of the Lower Canadian House of Assembly. Since the early 1800s Burns had been publishing advertisements regularly in the Quebec Gazette inviting prospective buyers to auction sales of ships – presumably ships that had been attached. Burns gave up this enterprise in 1811, handing it over exclusively to his partner in this field, Robert Melvin, the son of the man who had introduced him to business. Burns also handled the assets and business affairs of various individuals, generally wealthy, who readily gave him power of attorney when they had to be out of the country. His competence and honesty were recognized by the merchants of the town and even beyond, for Burns also had close relations with business circles in England. He turned out to be a capitalist on a grand scale who, surprising though it may seem, lent vast sums to prominent English merchants and London firms. In 1808, for example, he advanced £6,000 (sterling) to a London firm so that it could build a ship. This sizeable amount shows that Burns was not afraid to take risks and that he had considerable funds at his disposal. In Lower Canada various leading merchants and other prominent people also owed him large sums. Among those who found themselves in this situation were Woolsey, with a debt amounting to £10,000 around 1816 and £24,000 in 1829, Noah Freer, one of the directors of the Quebec Bank, Chief Justice Jonathan Sewell*, whose daughter Eliza Jannet Sewell was a god-daughter of Burns, and Mathew Bell*, a legislative councillor who owed him £ 10,000 in 1829. Burns’s role as banker enabled him to make attractive profits through the six per cent annual interest paid him on the capital borrowed. It was also one of some social significance, since there were no banks in Lower Canada until 1817 and 1818. As a result, there was a need for capitalists with a sound financial base who had surplus funds to invest in the commercial endeavours of other big merchants, thus promoting the country’s economic development. From 1816 Burns, who was now elderly, began to slacken the pace of his activities. On 5 September of that year he announced in the Quebec Gazette his intention of retiring from business shortly. He none the less went on attending to his affairs. In 1817 he again announced that he was retiring, but one William Smith continued to run his wholesale and retail stores. In 1818 and 1819 Burns put his share holdings up for sale, including those in the Dorchester Bridge and the Union Hotel. From 1819 he lived principally on his private income, that is, the interest his many debtors paid on the considerable sums he had lent. Burns, who had been promoted ensign in 1787 in the Quebec Battalion of British Militia, rose to become lieutenant-colonel of the town’s 3rd Militia Battalion in 1812. 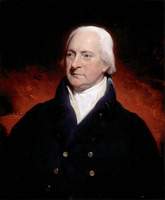 Though only modestly interested in public office – he turned down a magistracy in 1809 – he was made a legislative councillor in January 1818, a position he held until his death. Council journals reveal him to have been an infrequent attender but an apparent supporter of John Richardson and the extreme wing of the English party. This appointment may be interpreted as a reward crowning a career in which he had always been faithful to Britain and had figured in the great expansion of commercial capitalism in Lower Canada. Towards the end of his life Burns took up social concerns such as the Agriculture Society in the district of Quebec, of which he was a member. He contributed financially to the society and to various other organizations, and gave money for the erection of a monument to Edward* Augustus, Duke of Kent and Strathearn. The Honourable William Burns had most certainly been a model for the business world. He had, in fact, been one of the small number of important merchants living in Lower Canada during the late 18th and the early 19th century to leave a debt-free estate. His material circumstances identified him with an immensely rich group. The inventory done after his death shows that there was nothing in his house, from the walnut and rosewood furniture to the Japanese liqueur-stands, the calling-card trays imported from China, and the fine linen, that was not highly desirable and imported. In short, his possessions reflected the wealth he had accumulated in large-scale business over the years. Never having married and having no direct heirs, Burns left more than £33,000 to his close friends and to the members of the Melvin family. Even more unusual, in addition to forgiving Woolsey’s debts, he left his former partner £5,000. William Burns had started in trade as a penniless youth. The financial success he attained demonstrated that, as a merchant, he was remarkably aware of the commercial trends of his time. ANQ-Q, CN1-16, 9 nov. 1808, 11 mai 1809, 20 nov. 1815, 17 juill. 1816; CN1-26, 19–20 oct. 1802, 6 juill. 1816; CN1-171, 5 juill. 1819; CN1-188, 20 oct. 1825, 30 sept. 1829, 15–16 avril 1830; CN1-197, 23 janv. 1822; CN1-230, 29 mai 1801; 4 juin 1803; 18 avril 1805; 6 mai 1807; 22 avril 1808; 31 janv. 1809; 8 avril 1812; 26 févr., 19 mai 1813; 16 août, 6 oct. 1817; 14 juin 1823; 25 avril 1825; CN1-262, 6 févr., 20 oct. 1804; 6 févr., 17 juin 1805; 5 oct. 1813; 10 oct. 1817. ASQ, Polygraphie, XXXVII, no. 12. AUM, P 58, U, Burns to Simon McTavish, 22 Aug. 1803; Burns & Woolsey to McTavish, Frobisher & Company, 20 June 1796. PAC, MG 19, A2, ser.3, 22: 3068, 3072, 3080, 3087, 3095–96; MG 23, GII, 3, vols.3–6; GIII, 13, 2: 147–49; RG 1, L3L: 26628, 62808–9; RG 42, E1, 1380, 1382; RG 68, 2: 99; 3: 515; General index, 1651–1841. “Les dénombrements de Québec” (Plessis), ANQ Rapport, 1948–49: 35, 85, 135, 185. L. C., Legislative Council, Journals, 1818–29. Quebec Gazette, 26 July 1787; 25 Aug. 1791; 19 Jan., 15 March, 10 May, 21 June 1792; 19 Sept., 28 Nov., 19 Dec. 1793; 12 June 1794; 4 June, 13 Aug., 15 Oct. 1795; 23 Feb., 18 May, 19 Oct. 1797; 9 May, 6 June 1799; 10 Dec. 1801; 17 June 1802; 10 March, 26 May, 6 Oct. 1803; 3 May, 14 June 1804; 19 Sept., 31 Oct. 1805; 4 Dec. 1806; 19 March, 20 Aug., 24 Sept. 1807; 15 March 1810; 3 Jan. 1811; 19 March 1812; 8 April 1813; 5 Sept. 1816; 25 June 1818; 9 Aug., 22 Oct. 1821; 21 April 1823. F.-J. Audet, “Les législateurs du Bas-Canada.” Quebec almanac, 1788, 1791, 1794, 1813–15, 1817, 1819–20. P.-G. Roy, Inv. concessions, 3: 201; 4: 189–90. “State papers – L.C.,” PAC Report, 1892: 219, 237. Tremaine, Biblio. of Canadian imprints, 355. Turcotte, Le Conseil législatif, 85. Paquet et Wallot, Patronage et pouvoir dans le Bas-Canada. P.-G. Roy, Toutes petites choses du Régime anglais, 1: 252–54. George Bervin, “Environnement matériel et activités économiques des conseillers exécutifs et législatifs à Québec, 1810–1830,” Material Hist. Bull. (Ottawa), 17 (1983), no. 1: 45–62. George Bervin and David Roberts, “BURNS, WILLIAM,” in Dictionary of Canadian Biography, vol. 6, University of Toronto/Université Laval, 2003–, accessed April 24, 2019, http://www.biographi.ca/en/bio/burns_william_6E.html.